Today, the Roanoke Island Commemorative Silver Half Dollar Coin remembers when John White returned to the island on August 17, 1590. Richard Hakluyt included in The Principal Navigations, Voyages, Traffiques & Discoveries of the English Nation, in Twelve Volumes, Volume VIII, published in 1904, the diary of John White for the Fifth Voyage to Virginia in 1590. The next morning being the 17 of August, our boates and company were prepared againe to goe up to Roanoak, but Captaine Spicer had then sent his boat ashore for fresh water, by meanes whereof it was ten of the clocke aforenoone before we put from our ships which were then come to an anker within two miles of the shore. The Admirals boat was halfe way toward the shore, when Captaine Spicer put off from his ship. The Admirals boat first passed the breach, but not without some danger of sinking, for we had a sea brake into our boat which filled us halfe full of water, but by the will of God and carefull styrage of Captaine Cooke we came safe ashore, saving onely that our furniture, victuals, match and powder were much wet and spoyled. For at this time the winde blue at Northeast and direct into the harbour so great a gale, that the Sea brake extremely on the barre, and the tide went very forcibly at the entrance. By that time our Admirals boate was halled ashore, and most of our things taken out to dry, Captaine Spicer came to the entrance of the breach with his mast standing up, and was halfe passed over, but by the rash and undiscreet styrage of Ralph Skinner his Masters mate, a very dangerous Sea brake into their boate and overset them quite, the men kept the boat some in it, and some hanging on it, but the next sea set the boat on ground, where it beat so, that some of them were forced to let goe their hold, hoping to wade ashore; but the Sea still beat them downe, so that they could neither stand nor swimme, and the boat twise or thrise was turned the keele upward, whereon Captaine Spicer and Captaine Skinner hung untill they sunke, & were seene no more. But foure that could swimme a litle kept themselves in deeper water and were saved by Captain Cookes meanes, who so soone as he saw their oversetting, stripped himselfe, and foure other that could swimme very well, & with all haste possible rowed unto them, & saved foure. They were a 11 in all, & 7 of the chiefest were drowned, whose names were Edward Spicer, Ralph Skinner, Edward Kelley, Thomas Bevis, Hance the Surgion, Edward Kelborne, Robert Coleman. This mischance did so much discomfort the saylers, that they were all of one mind not to goe any further to seeke the planters. But in the end by the commandement & perswasion of me and Captaine Cooke, they prepared the boates: and seeing the Captaine and me so resolute, they seemed much more willing. Our boates and all things fitted againe, we put ofF from Hatorask, being the number of 19 persons in both boates: but before we could get to the place, where our planters were left, it was so exceeding darke, that we overshot the place a quarter of a mile: there we espied towards the North end of the Iland ye light of a great fire thorow the woods, to the which we presently rowed: when wee came right over against it, we let fall our Grapnel neere the shore, & sounded with a trumpet a Call, & afterwardes many familiar English tunes of Songs, and called to them friendly; but we had no answere, we therefore landed at day-breake, and comming to the fire, we found the grasse & sundry rotten trees burning about the place. From hence we went thorow the woods to that part of the Hand directly over against Dasamongwepeuk, & from thence we returned by the water side, round about the North point of the Iland, untill we came to the place where I left our Colony in the yeere 1586. In all this way we saw in the sand the print of the Salvages feet of 2 or 3 sorts troaden ye night, and as we entred up the sandy banke upon a tree, in the very browe thereof were curiously carved these faire Romane letters C R O: which letters presently we knew to signifie the place, where I should find the planters seated, according to a secret token agreed upon betweene them & me at my last departure from them, which was, that in any wayes they should not faile to write or carve on the trees or posts of the dores the name of the place where they should be seated; for at my comming away they were prepared to remove from Roanoak 50 miles into the maine. Therefore at my departure from them in An. 1587 I willed them, that if they should happen to be distressed in any of those places, that then they should carve over the letters or name, a Crosse X in this forme, but we found no such signe of distresse. And having well considered of this, we passed toward the place where they were left in sundry houses, but we found the houses taken downe, and the place very strongly enclosed with a high palisado of great trees, with cortynes and flankers very Fort-like, and one of the chiefe trees or postes at the right side of the entrance had the barke taken off, and 5 foote from the ground in fayre Capitall letters was graven CROATOAN without any crosse or signe of distresse; this done, we entred into the palisado, where we found many barres of Iron, two pigges of Lead, foure yron fowlers, Iron sacker-shotte, and such like heavie things, throwen here and there, almost overgrowen with grasse and weedes. From thence wee went along by the water side, towards the poynt of the Creeke to see if we could find any of their botes or Pinnisse, but we could perceive no signe of them, nor any of the last Falkons and small Ordinance which were left with them, at my departure from them. At our returne from the Creeke, some of our Saylers meeting us, tolde us that they had found where divers chests had bene hidden, and long sithence digged up againe and broken up, and much of the goods in them spoyled and scattered about, but nothing left, of such things as the Savages knew any use of, undefaced. Presently Captaine Cooke and I went to the place, which was in the ende of an olde trench, made two yeeres past by Captaine Amadas: wheere wee found five Chests, that had bene carefully hidden of the Planters, and of the same chests three were my owne, and about the place many of my things spoyled and broken, and my bookes torne from the covers, the frames of some of my pictures and Mappes rotten and spoyled with rayne, and my armour almost eaten through with rust; this could bee no other but the deede of the Savages our enemies at Dasamongwepeuk, who had watched the departure of our men to Croatoan; and as soone as they were departed, digged up every place where they suspected any thing to be buried: but although it much grieved me to see such spoyle of my goods, yet on the other side I greatly joyed that I had safely found a certaine token of their safe being at Croatoan, which is the place where Manteo was borne, and the Savages of the Iland our friends. When we had seene in this place so much as we could, we returned to our Boates, and departed from the shoare towards our Shippes, with as much speede as wee could: For the weather beganne to overcast, and very likely that a foule and stormie night would ensue. Therefore the same Evening with much danger and labour, we got our selves aboard, by which time the winde and seas were so greatly risen, that wee doubted our Cables and Anchors would scarcely holde untill Morning: wherefore the Captaine caused the Boate to be manned with five lusty men, who could swimme all well, and sent them to the little Iland on the right hand of the Harbour, to bring aboard sixe of our men, who had filled our caske with fresh water: the Boate the same night returned aboard with our men, but all our Caske ready filled they left behinde, unpossible to bee had aboard without danger of casting away both men and Boates: for this night prooved very stormie and foule. The next Morning it was agreed by the Captaine and my selfe, with the Master and others, to wey anchor, and goe for the place at Croatoan, where our planters were: for that then the winde was good for that place, and also to leave that Caske with fresh water on shoare in the Iland untill our returne. 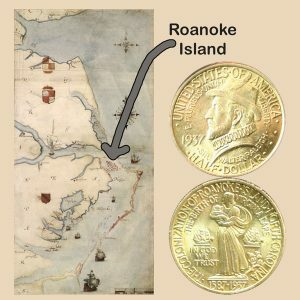 The Roanoke Island Commemorative Silver Half Dollar Coin shows with an image of a map of the east coast drawn by John White based on his voyages to the area.